Significant efforts already been made to reduce membrane fouling by improving membrane properties (hydrophilicity and surface charge), optimization of operating condition, impulsive change of environmental conditions (pH, ionic strength, temperature and electric field), and the pretreatment of feed water. In commercial membrane modules, fouling is effectively controlled by the incorporation of a feed spacer in the membrane channel. A feed spacer changes the streamlines from parallel lines to irregular rotational lines causing better mixing of flow. The increased power of vortices, especially at higher flow rates, reduces the development of concentration polarization and fouling on the membrane surface. However, applying feed spacer increases membrane module construction cost and pumping energy to compensate the pressure loss across the spacer-filled feed channel. The goal of this research is to synthesize novel antifouling membranes by fabricating sub-micrometer-sized features on their surface using electro-hydrodynamic lithography (EHL) and hydrogel molding (HM) techniques. In the EHL process, an applied electric field destabilizes the interface of liquid films and binding media, leading to the evolution of patterns. 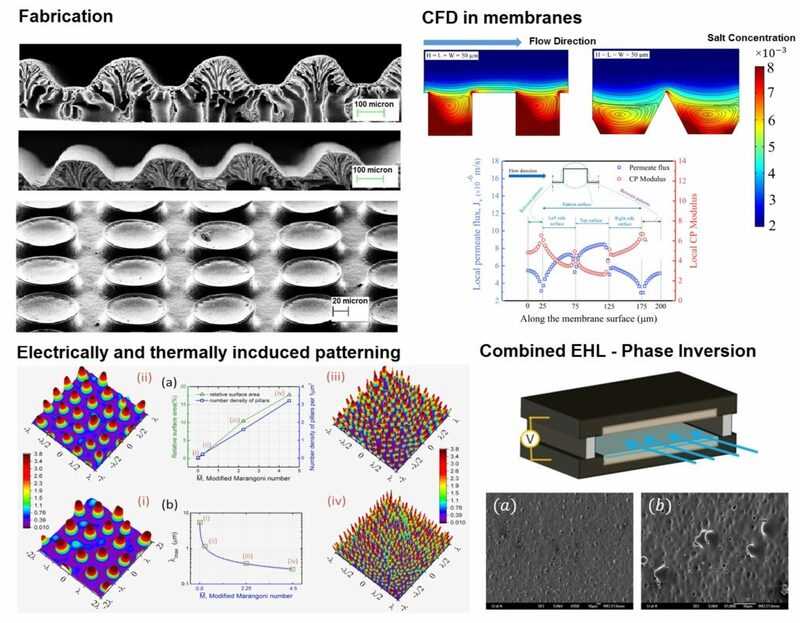 EHL is widely used for destabilization of ultra-thin liquid/molten films (thickness < 100 nm), However, its application in the patterning of membrane surfaces has not been explored so far. In HM, the thin polymer film is cast on a patterned hydrogel and the controlled demixing of solvent and nonsolvent leads to the formation of patterned membranes by phase inversion. Numerical and experimental studies enhance the efficiency of EHL and HM. The self-assembled arrays of pillars are predicted to act like baffles in a membrane feed channel, which can terminate practice of “feed spacers” as turbulence promoter objects for reducing polarization phenomena near the membrane surface.